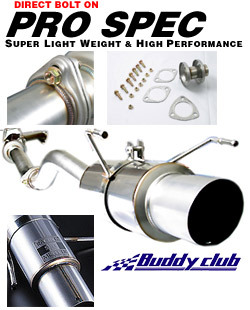 The Buddy Club Pro Spec Exhaust is a super light weight and highly efficient muffler that is made to perform for circuit runs. In its street version, to optimize torque in the low to mid speed range, it is equipped with an efficient middle silencer (resonator). Pro Spec Mufflers were designed for high performance as well as meeting sound level standards. With its deep throaty tone, it echoes its racing lineage. The middles silencer achieves both exhaust efficiency and sound dampening requirements. Usual mufflers are designed to ?muffle? sound and results in restricting performance. Our mufflers, with results of trial and error, have developed the highest possible performance while maintaining a low throaty tone. We only used the finest material, that meets high endurance, light weight, and excellent fit. Improvement in durability can be seen by the use of ?band- stay? hooks as attachment to the main silencer.The absence of welds help maintain the light weight frame. In continuing the light weight form the muffler tip is made with a slight incline cut.This is a demonstration of commitment to performance and style.